Standing on the corner of Dowling and Water Street, the hand forged aluminum weather-vane is 48 feet high, 14 feet long, and weighs 4,300 pounds. 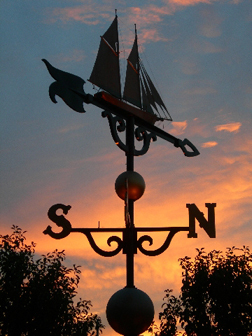 This operating weathervane has a working weather station in its base with foot access available. The ship on top of the weathervane is the Ella Ellenwood, a Great Lakes lumber schooner whose home port was White Lake, off Lake Michigan, in Montague. In October of 1901, the Ellenwood ran aground with a full load eight miles north of Milwaukee. The crew abandoned ship, and the wind and waves of a fall storm broke the ship to pieces. The next spring, a portion of the ship’s nameplate, bearing the word “Ellenwood,” was found in White Lake. Almost miraculously, the nameplate had drifted back east across Lake Michigan to the ship’s home port! The nameplate is still exhibited in the Montague City Hall.